It was a Cheesy day, a Cheesy Friday to be exact, a yummy one as well! Thanks to Mochachocolata Rita, I was lucky enough to be invited to this Cheesy night event! How cheesy? 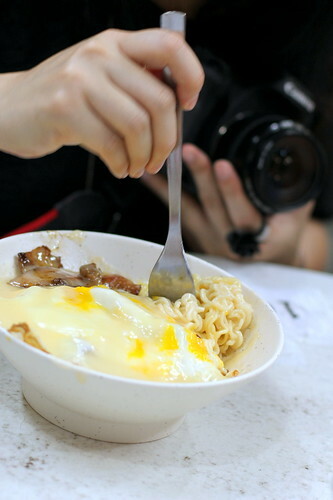 This resto hiding inside an old building in TST is known for its cheese instant noodles. A neighborhood kind of a joint with tables tightly packed together; expect to share a table with strangers or perhaps pretty girls and handsome guys if you are luck. 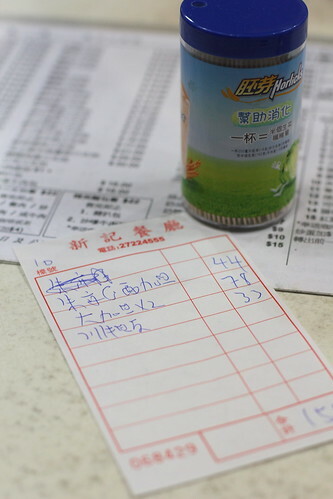 There are several variations and being the hungry me, I ordered the one with almost everything! Deep fried pork chops, chicken wings and fried eggs! Rita knew EXACTLY what I wanted to do before I reach for the bowl hence the wonderful styling of the noodles! Thanks Rita! The cheese sauce was creamy to a point being a bit too starchy. More sauce would be nice and a strong cheese flavor would be nice great. 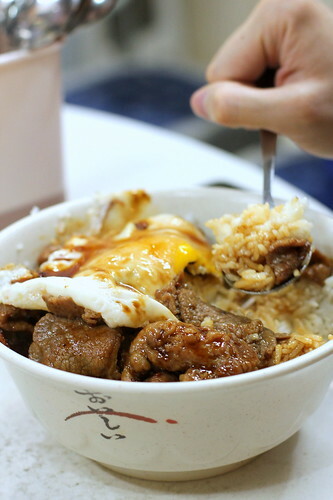 Spicy Beef Rice with egg was another item on the menu which was tempting but quite spicy as being told. 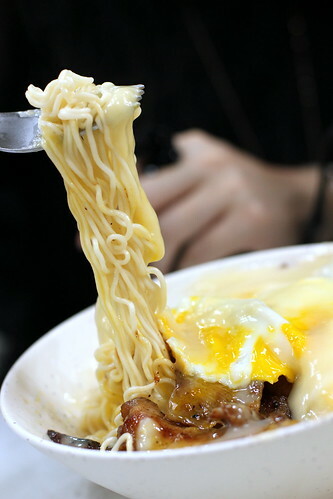 Looks like a Hong Kong style Hawaiian noodle bowl, except more calorific! This place isn't cheap as well I think! I like their concept. I even like their char-grilled but not charcoal-grilled pork neck! 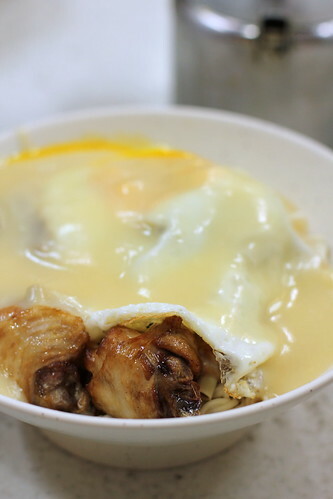 I had a pretty good cheese sauce dish in another place before ages ago... let me see if I can write that soon haha!